In long-standing traditions, people the world over eat certain foods to ring in the New Year. We’re aiming to fix a New Year’s Eve dinner with all of them. Here are the foods that hopefully bring health and prosperity in the new year. Coincidentally, all of them are very nutritious—another reason to enjoy them as you usher in the new year. Beans: money. Ancient man used certain beans as currency (cacao beans are the most famous example). As civilization evolved, beans symbolized coins. Beans are a nutritional powerhouse: Make a New Year’s resolution to add more of them to your weekly diet. Enjoy a bean salad or hot bean dish: anything from black beans to lentils to the Hoppin’ John recipe below, made with black-eyed peas and rice. Check out our Beans Glossary for more bean inspiration. Figs: fertility. Want to hear the patter of little feet in the new year? Chow down on figs. We love them with fresh goat cheese. One of the first foods cultivated by man, figs are naturally rich in minerals and vitamins, including antioxidants. Fish: money. Silvery scales resemble money and fish swim in schools, which signifies abundance. Fish are packed with nutritional benefits, from protein to omega 3s in fatty fish (mackerel, salmon, sardines and tuna—head for the sushi bar). Grains: abundance. We’re making risotto—a personal favorite. Make recipes with whole grains, and you’ll get lots of fiber and nutrients that can lower cholesterol, risk of heart disease, diabetes and other health problems. Beyond brown rice, work barley, quinoa and other whole grains into your repertoire (list of whole grains and more health benefits). Check out our Beans & Grains Glossary and our Rice Glossary. Grapes: a sweet year. When the clock chimes 12, Mexicans pop 12 grapes, one for each stroke of midnight. Each grape represents a month. If you get a bitter grape, beware of that month! Greens: money. Green vegetables are full of vitamins, minerals and fiber and are low in calories. Make anything from your favorite Brussels sprouts dish to a big green salad. Noodles: long life. Whole wheat and buckwheat noodles (like Japanese soba) are a great source of fiber. Enjoy your favorite pasta or Asian noodle dish. Pork: good luck. Pigs are a lucky symbol because they root forward and are rotund. Include some bacon, pork or sausage in your New Year’s Eve dinner. Pomegranate seeds: prosperity. The pomegranate’s many seeds symbolize abundance. Scatter them in sauces; sprinkle them on everything from porridge and yogurt to luncheon salads to ice cream and sorbet. Enjoy Hoppin’ John as a hearty side with your favorite protein and a green salad (toss grapes and pomegranate seeds into that salad to up the good luck ante). This recipe is courtesy Frieda’s, one of America’s finest specialty produce companies. Use dried habaneros if you like a slightly milder, smokier flavor. 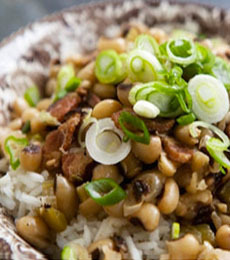 Black-eyed or blackeyed peas are a Southern specialty. Photo courtesy Zursun. 1. COMBINE rice with blackeyed peas and water in a Dutch oven. Stir in thyme and bay leaf. Cover and bring mixture to a boil. Uncover and reduce heat and simmer 15 to 18 minutes or until rice and beans are done, checking to make sure mixture does not boil dry. 2. MEANWHILE, in a medium skillet, cook bacon until crisp. Drain bacon on paper towels, reserving 2 tablespoons of drippings in skillet. Add onion, bell pepper, celery, parsley, garlic, and habanero chile to drippings in pan. Sauté about 3 minutes or until vegetables are tender. Crumble bacon; add to skillet. Remove from heat. 3. DRAIN off any excess liquid when rice and beans are done. Remove bay leaf. Stir bacon mixture into rice and beans. The longer it sits, the more the flavors blend. WHO IS HOPPIN’ JOHN NAMED FOR? Probably, nobody. 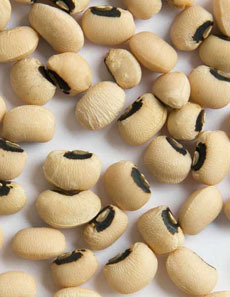 Some food historians believe that the name is a corruption of the Haitian Creole term for blackeyed peas: pois pigeons (pwah-pee-JONE).